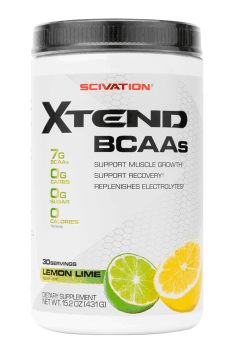 Xcelerate your workouts with Scivation Xtend! Increase the effectiveness of each workout by taking Xtend preworkout, and during workouts for improved stamina and endurance. Xtend also offers a boost to training sessions for athletes for quick recovery and prolonged performance. Decrease muscle breakdown and cortisol levels. Avoid fatigue by blocking entry of fatigue-inducing tryptophan into the brain. BCAA works best at the moments of the highest need for amino acids, i.e. around training. Sometimes it is also worth applying when we have a long-lasting break between meals to avoid catabolism. The size of the suggested portion should be sufficient for the majority of sportsmen. SCIVATION is a manufacturer of supplements respected among athletes. The company offers amino acids supplements, which increase the level of growth hormone, slows down catabolism and speed up the regeneration of the body. Their product range also includes protein supplements. Natural and Artificial Flavor, Citric Acid, Sucralose, Malic Acid, Acesulfame Potassium, FD&C #Red 40.